UPDATES :- Summer Internship Program 2019 at SAITAMA University japan. | Jobs Opportunity in Japan under TITP program | Congratulations to Science Department for Achieving 99% Result | Admissions Open 2018-19 | Click here to see latest Campus Activities | Biyani Group signed MOU with Kyushu University Japan. | Biyani Group signed MOU with Brahma kumaris Ishwariya Vishwa Vidhyalaya. The Biyani Shikshan Samiti is formed by young, dynamic and result oriented team of highly qualified persons. It is registered under the Rajasthan Society Registration Act, 1958 having Reg. No. 500/Jaipur/97-98 dated 29th December 1997. 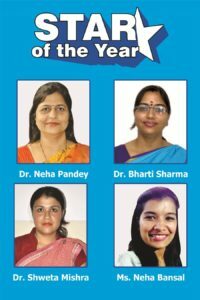 The mission of the Samiti is to keep pace with the futuristic growing civilized world through women empowerment. It intends to develop young women who possess knowledge and confidence to keep pace with the rapid changing world, increasing competition without losing traces of our traditions, humanity, spirituality and purpose of existence. Our main objective of teacher’s training course is to help future prospective teacher to develop competence to teach subjects of their specialization, on the basis of an adequate theory of learning and a sound knowledge of the subjects. We want to develop an understanding of the close relationship between society and school, life and school, and life and social work. 89 Acad. Director 31-Jan-2019 Summer Internship Program 2019 at SAITAMA University japan. 88 Acad. Director 02-Jan-2019 Brochure of Faculty induction and refresher program 2019. 87 Acad. Director 24-Dec-2018 Notice for students Regarding Microsoft office specialist World Championship. 86 Acad. Director 13-Dec-2018 Regarding Inter University Women’s Basketball Training. 85 Principal 11-Dec-2018 Regarding Internal Exams – Arts Department. 84 Principal 05-Dec-2018 Regarding holiday on 7 December. 83 Acad. 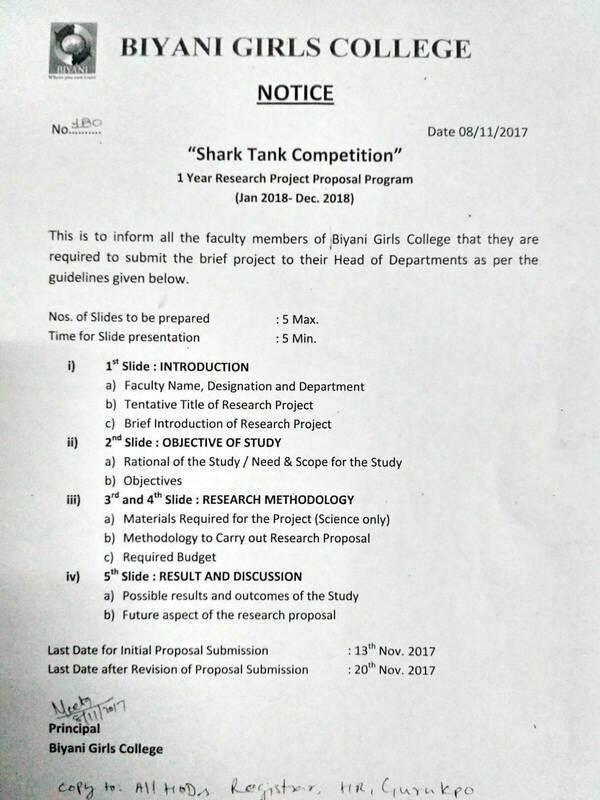 Director 20-Nov-2018 Regarding Basketball tournament for Biyani Girls College students. 82 Acad. Director 20-Nov-2018 Regarding Basketball tournament for Biyani Girls College students. 81 Acad. Director 19-Nov-2018 Notice for Information seminar on opportunities in aviation. 80 Principal 15-Nov-2018 Notice for flower exhibition. 79 Principal 15-Nov-2018 Instructions for Teaching staff Regarding BICON 2018. 78 Chief Warden 15-Nov-2018 Regarding driving classes for students. 77 Principal 14-Nov-2018 Regarding Road safety seminar. 76 Director Acad. 11-Oct-2018 Regarding Student’s Council. 75 Registrar 01-Oct-2018 Office Order for Mercy Chance to MCA 2012 & MBA 2014 admitted batches. 74 Director Acad. 23-July-2018 LLB I and III Year Viva Notice. 73 Director Acad. 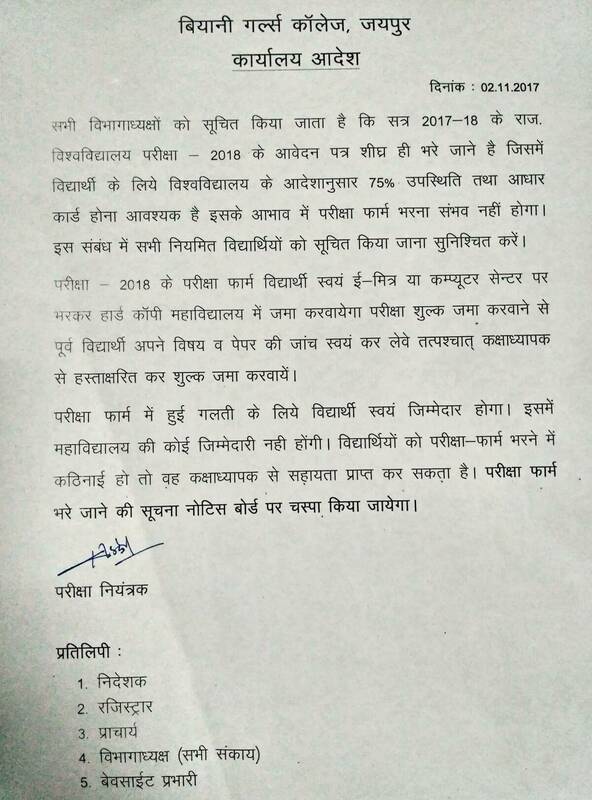 23-July-2018 LLB II Year Viva Notice. 72 Director Acad. 16-June-2018 Chanakya Faculty Development Programme 2018. 71 Director Acad. 1-June-2018 Download Admission Form 2018-19. 70 Director Acad. 11-May-2018 Reference Link for Approved sending organizations under Indo-Japan Technical Internship Program (TITP). Click Here to visit official website of Technical Intern Training Organization of Japan. 69 Director Acad. 30-Mar-2018 Notice regarding Indo-Japan Internship Program. 68 Principal 9-Feb-2018 Notice regarding college picnic. 67 Principal 22-Dec-2017 Notice for Students regarding Women Santa Run. 66 Principal 22-Dec-2017 Notice for Staff members regarding Women Santa Run. 65 Principal 13-Dec-2017 Regarding Parents teacher meeting on 17 Dec.
64 Director Acad. 12-Dec-2017 Regarding Placement drive for MCA, BCA students on 13 Dec.
63 Principal 28-Nov-2017 Regarding 1 week Japanese language course. 62 Administrator 24-Nov-2017 Regarding Passport Drive. 61 Principal 22-Nov-2017 Regarding Biyani Youth Fest- Spectrum 2017. 60 Principal 10-Nov-2017 Regarding upcoming important events of college. 59 Principal 9-Nov-2017 Regarding internship and placement drive for students on 10-Nov-2017. 58 Principal 8-Nov-2017 Regarding Research project proposal program. 57 Exam Controller 2-Nov-2017 Regarding University Exam mandatory rules. 56 Director Acad. 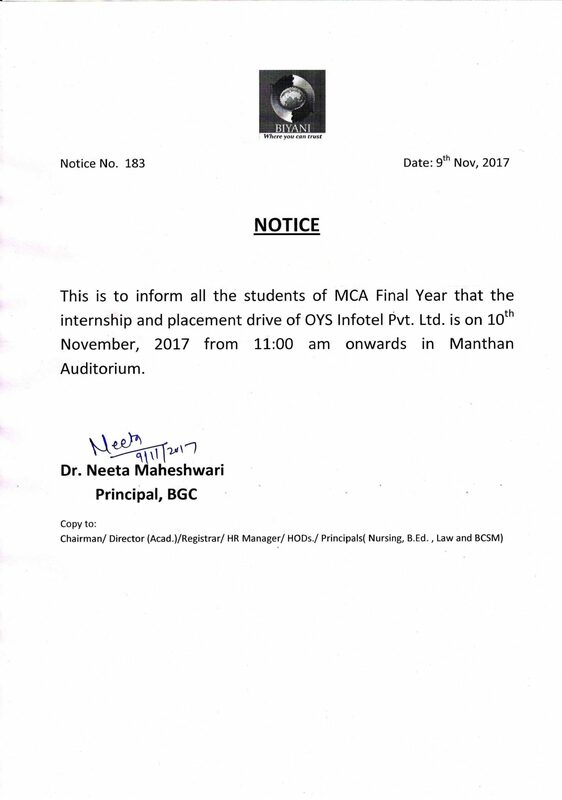 25-Oct-2017 Regarding MCA student’s industrial visit on 26-Oct-2017. 55 Director Acad. 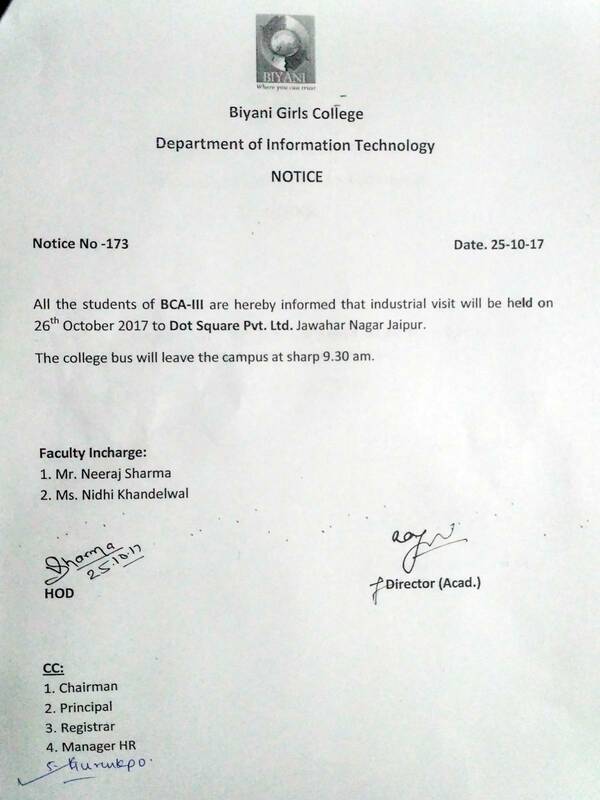 25-Oct-2017 Regarding BCA student’s industrial visit on 26-Oct-2017. 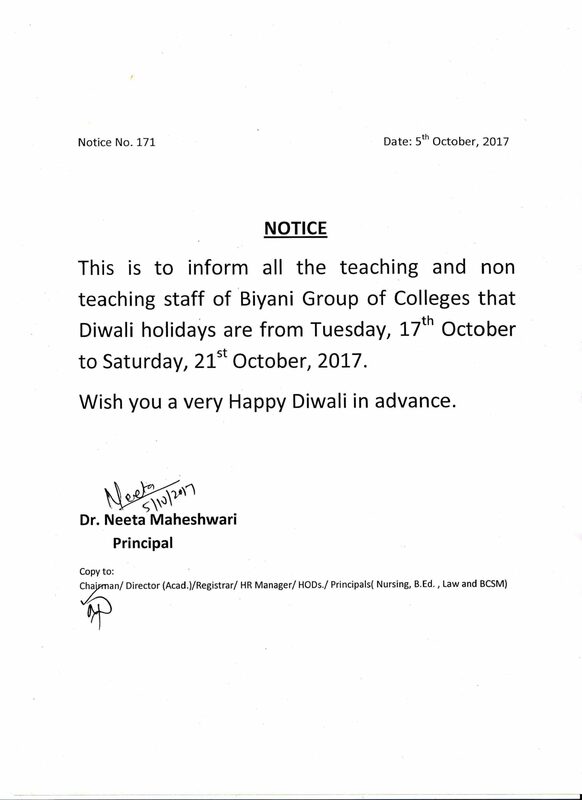 54 Principal 05-Oct-2017 Regarding Diwali Holidays for Staff members. 53 Principal 05-Oct-2017 Regarding Diwali Holidays for Students. 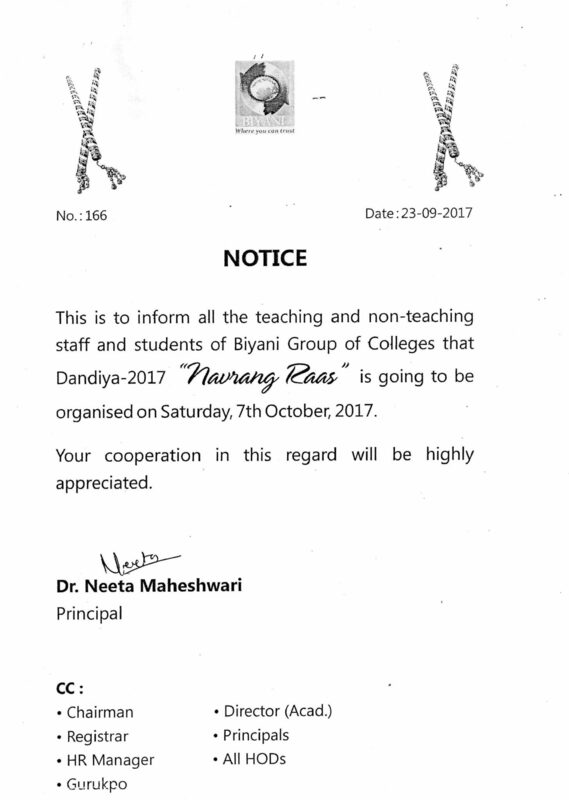 52 Principal 23-Sept-2017 Regarding Dandiya Program on 07-Oct-2017. 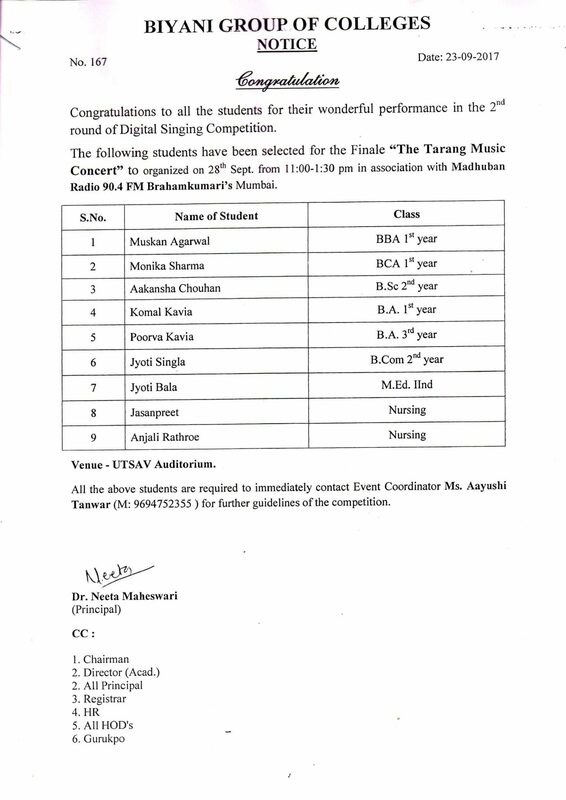 51 Principal 23-Sept-2017 Regarding Tarang Music Concert on 28-Sept-2017. 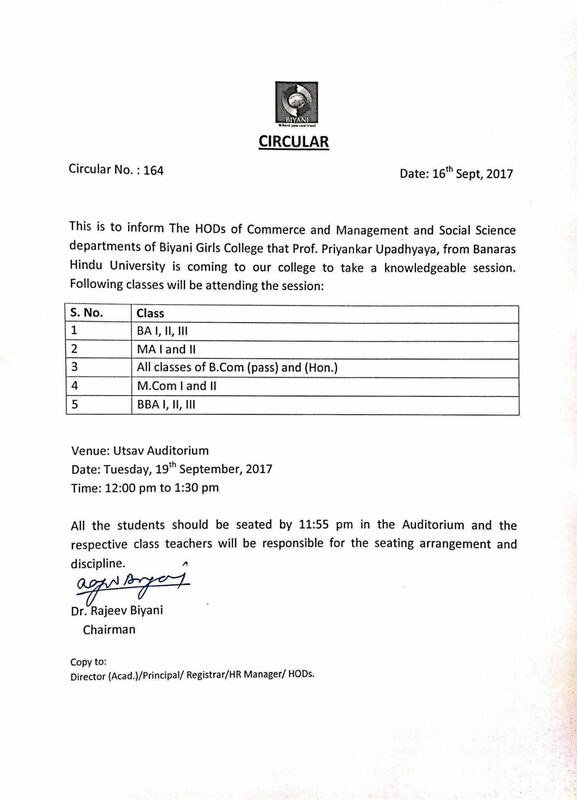 50 Chairman 16-Sept-2017 Regarding Guest lecture by Prof. Priyankar Upadhyaya from BHU on 19-Sept-2017. 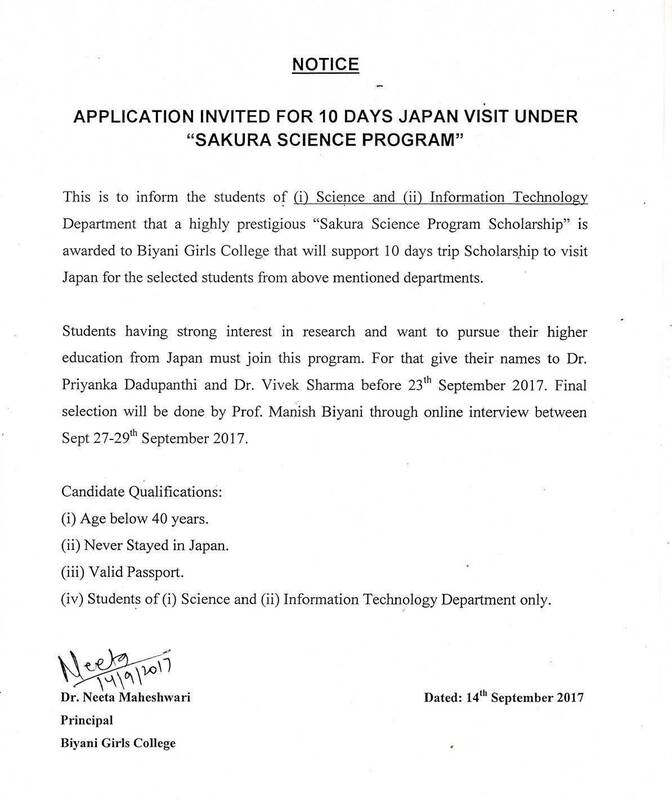 49 Principal 14-Sept-2017 Regarding 10 Days Japan visit under “Sakura Science Program”. 48 Director Academics 7-Sept-2017 Regarding MCA 2011 & MBA 2013 Mercy Back Exam Form fill. 47 Registrar 11-Sept-2017 Regarding The counselor Show for students. 46 Director Academics 26-Aug-2017 Regarding The counselor Show for students. 45 HR Manager 26-Aug-2017 Regarding professional counseling services for students. 44 Director Academics 24-Aug-2017 Regarding Mandatory AADHAR Card to fill University exam form. 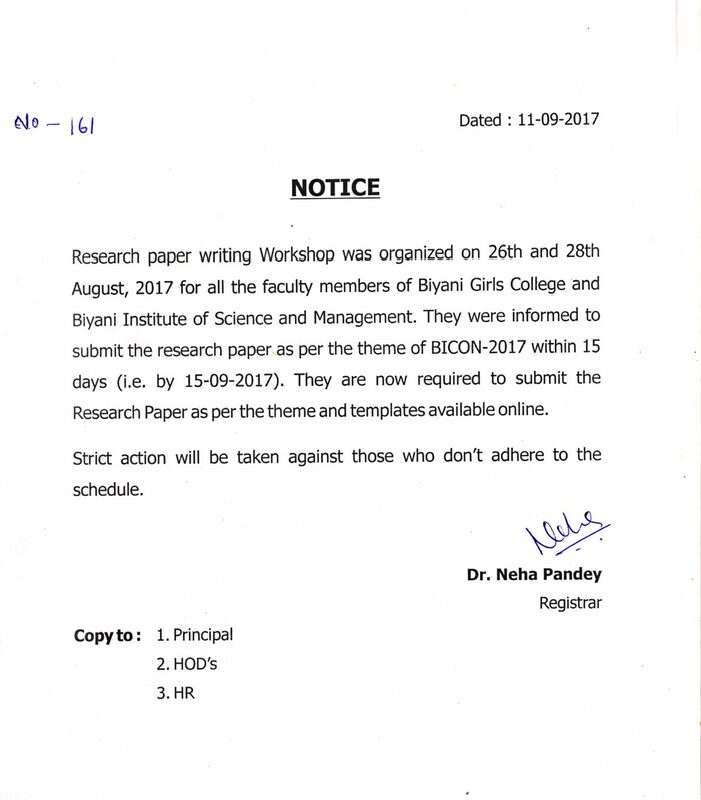 43 Director Academics 23-Aug-2017 Research Paper writing Workshop. 42 Exam Controller 18-July-2017 Important regarding Supplementary examination. 41 HOD 23-June-2017 Law Students practical Viva is on 5 July 2017 at 9:00 AM and you have to come college on 30 June at 11:00 AM for Moot Court diary. 40 HOD 25-May-2017 Latest Revised Time table for B.Com III Examination. 39 Director Acad. 24-April-2017 Notice regarding Online payment/PayTm Training. 38 Principal BGC 11-April-2017 Notice regarding Seminar on abandoning Plastic Bags. Academic Alliance between Biyani Group of Colleges and JAIST- JAPAN. Apply for various Job Openings at Biyani Group. Use 3D formula in Life “Discipline, Dedication and Devotion” – Shree Hita Ambrish (Spiritual Mentor) Let’s Craft Our self – A talk by Shree Hita Ambrish Ji at Biyani Group of Colleges . Day 1 – India- Japan Fest BICON 2018 Biyani Group of colleges Jaipur organizes India-Japan Fest, “BICON-2018” from 25th to 28th Nov is jointly Sponsored by ICSSR. Opening ceremony – India- Japan Fest BICON 2018 Biyani Group of colleges Jaipur organizes India-Japan Fest, “BICON-2018” from 25th to 28th Nov is jointly Sponsored by NAAC and ICSSR. 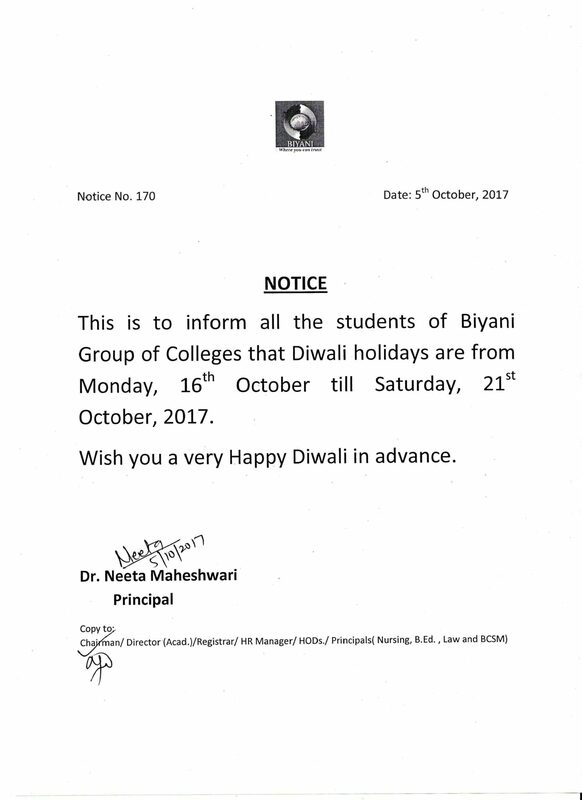 Diwali Celebration at Biyani College. I am really impressed by the young girl students, their energy level and enthusiasm. There is lots of positive energy and vibration in Biyani College. I am so so so happy… because I could meet such charming girls. It is an important memory for me. The campus is so beautiful. Excellent interaction with students and the college is going in the right direction of exposing students to the industry. Institution in serving a great cause, improving the daughters of Rajasthan and all our India. Biyani Girls College is making a tremendous effort in bringing industry and world technologists on a platform accessible to students, to answer in simple words. Kirit Bhaiji known as Acharya Brahmarushi Param Pujya Shri Kirit Bhaiji is a popular Hindu orator who has spoken on over 150 Hindu topics ranging from the traditional Ramayan, Mahabharat, and Bhagvad Gita, to the precise incantations of Shri Suktam and Rudrashtakam. Bhaiji, also known as Rushivar has held 9-day long sermons or Kathaas in India, England, Kenya, United States, Australia, New Zealand and many more nations. As well as having innumerable Shrotas (listeners), Bhaiji is the Guru, or preceptor of over 150,000 Shishyas (followers).